Nothing new about this comforting dish. You probably have all of the ingredients on hand right now to make it. Melt butter in a small pan; add onion and cook several minutes. Stir in flour; cook 2 minutes. Whisk in milk, stirring constantly; bring to a simmer and cook 2 more minutes. Remove from heat and add salt, pepper and a few swipes across a micro-plane of whole nutmeg. Stir in 1 cup cheese and ketchup, if using. Place a half of the sliced potatoes in a lightly buttered or sprayed one-quart casserole dish. Sprinkle the remaining cheese. Sprinkle lightly with paprika. Bake uncovered for about 1 hour at 350°F. (I bake in toaster oven and cover with foil if browning too much). My husband will be so very happy if I make these. Thank you for including the easy to print recipe. Because we both like the taste of ketchup, we will try it your way. Thanks so much for sharing another one of your amazing recipes. This looks so yummy…I love the addition of the ketchup! Must be the little kid in me too! I bet it tastes as good as it looks, Thanks for sharing, I am printing this one for sure. Scrumptious looking and I'm printing this recipe right now! Thank you for sharing! My mother used to make scalloped potatoes and I used to…a lot. 🙂 Thanks for the reminder of this special comfort food! I've been having so many technical problems around here and haven't been visiting as much as I'd like. Old-Time Recipes are often the best. Thanks. Yes, the package is here. It is at my daughters house..we were out of town until today and I will go get it tomorrow. Thanks so so much and I'll get back to you when I can use this notebook again just know the pkg. arrived safe and sound. What a perfect dish of comfort food, Lorraine! 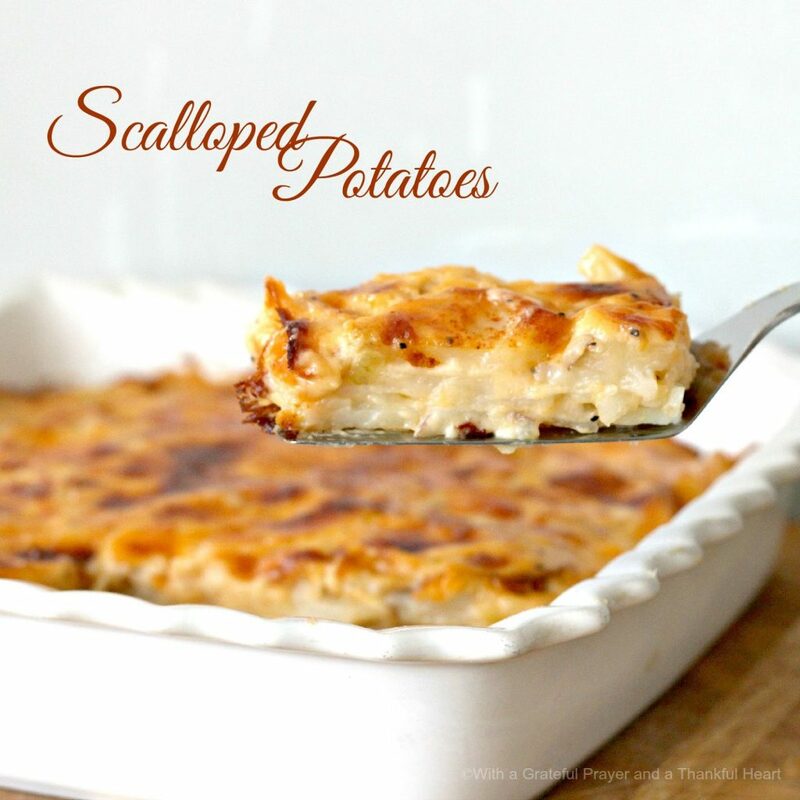 Who doesn't love a creamy dish of scalloped potatoes? These would be a perfect addition to an Easter buffet. Yum…the perfect dish for this kind of chilly weather. =) I made stuffed peppers this week and they were so good. Hope your day is fun…I hope mine will pick up some energy….smile. Hi Lorraine! My daughter and her little ones are coming to stay for a few days next week. This looks like a perfect side-dish to warm us up. It's still cold here! You are so right! Scalloped potatoes are the ultimate comfort food. Yours look awesome! Your food photography is always beautiful! One of my husband's favorites. We have it often for New Years or Easter … I guess I should be thinking about it soon! Love this wonderful confort food the best! I like your récipe sweetie…thanks for sharing. I'm Hungry. Ah, YUM. What time is dinner? I haven't made scalloped potatoes in ages. Looks wonderful.